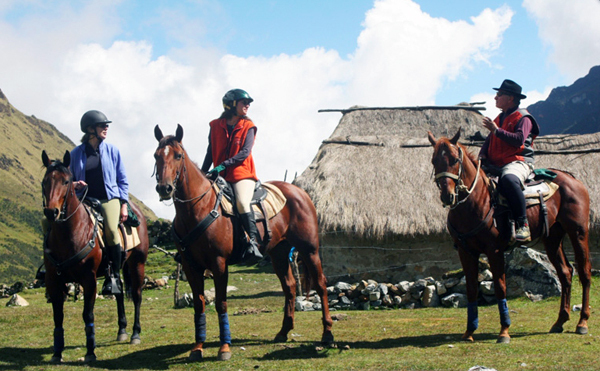 On a new, seven-day equestrian vacation, travelers can now experience the only lodge to lodge horseback ride to Machu Picchu, a once in a lifetime trip that combines ancient history, authentic culinary delights, exotic flora and fauna and local culture. This has been a dream in the making for Mountain Lodges of Peru owner Enrique Umbert Sr., who leads many of these Andes treks and is the CEO the company. For over 15 years, Enrique has been working to bridge the gap between the remote Andean Mountains and the world. Building these eco-friendly resorts in this secluded location wasn’t easy. Touted by Travel & Leisure magazine as one of some “World’s Most Remote Hotels,” these Peruvian lodges have been constructed in traditional Andean design with modern creature comforts including hot tubs, down bedding and gourmet food and wines. 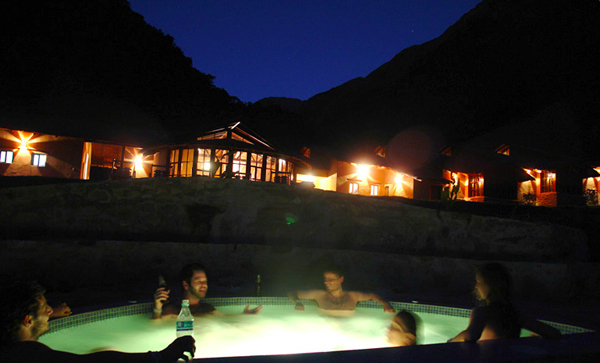 After a rugged day on the trails, you can get cozy as you take in views of Salkantay Peak, one of the most important mountains in Inca mythology, from a well-appointed lodge. A former commodities trader, Enrique grew up in the city of Arequipa in the Andes in Southern Peru. As in many of our “Meet Your Host” interviews, I wanted to delve further into what inspired Enrique to create these special lodges and adventures and what travelers can expect who undertake the horse trek to Machu Picchu. 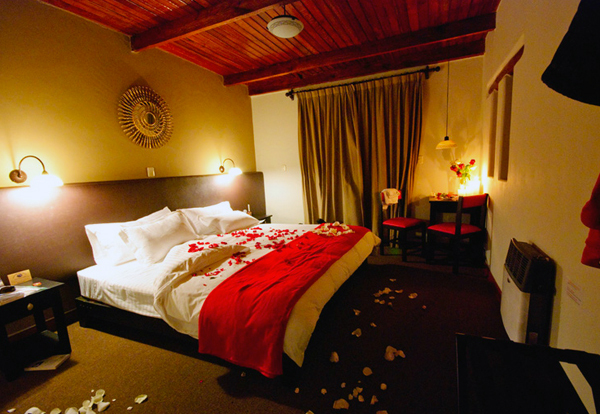 Darley: What inspired you to build a series of lodges in the remote Peruvian Andes? Enrique: I was really impressed by the beauty of the territory, and I figured that a lot of people would come see it if I provided them with comfort and hospitality every step of the way. I knew that the local people were my most precious asset in accomplishing this. Their natural sense of hospitality and kind ways would be something the visitors would never forget. Darley: A few of your lodges along the Salkantay Trail to Machu Picchu are only accessible by foot or horseback. How difficult was it to build lodges along this trail? Enrique: A lot more difficult than I had imagined. The red tape we had to go through was only the beginning of an arduous journey to get the lodges built. 9000 mule trips, 145 porters, 4 construction crews, 2 helicopter loaded flights, recruitment and training of personnel, and a lot of perseverance resulted in a happy achievement in a 10-month marathon which saw our first group of guests come through in June 2007. Darley: Wow! That is quite a feat! Last year, Mountain Lodges of Peru was awarded the grand prize in the international TO DO! Contest for socially responsible tourism. What does being socially responsible mean to you personally and how does you work to enact positive change through welcoming travelers to the Andes? Enrique: I have come to understand that the concept of social inclusion is key to being a 21st century company and actually carrying out social responsibility in a meaningful way. We try to involve our neighbors in the mainstream of our business every day, in every opportunity which presents itself, and lead by example in terms of ecological, health and family values with self-esteem. Darley: The Salkantay Trail and trek to Machu Picchu takes travelers to high altitudes. What do you recommend to travelers to help them adjust to the changing altitudes? Are there any local remedies that you use on the trail? I read about coca-leaf tea, a Peruvian remedy for altitude sickness. Does that really work? Enrique: Altitude must be treated with respect. Acclimatization is vital. Keeping your body well hydrated is also key. The general idea is to consume lots of liquids starting with plain water and also trying the wonderful herbs available in the Anes. Coca leaf tea is a good choice, but there are many others which we make available to our guests. Darley: What types of cultural experiences can travelers expect on the ride to Machu Picchu? Enrique: I truly believe that the most rewarding cultural experience is achieved through the contact with mankind. We are very fortunate in our journey as we get the chance to see fully functional hamlets and villages where families are leading lives which contain a lot of good lessons for our modern conception of man and society in the developed world. The communal spirit developed by the need to survive and go forward in these communities is alive and well. The journey also helps to understand how this great culture developed its communication systems and its harmony with Mother Nature in all regards. 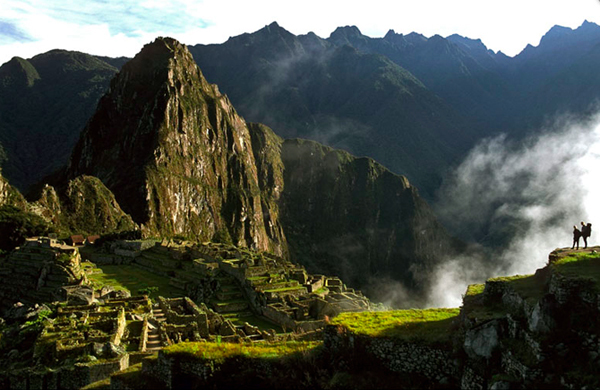 We travel through actual Inca trails and can grasp a feeling of what it was like back then. Darley: How do you get the horses in shape for this type of strenuous mountain trek? Enrique: Our horses get their training by travelling along the route constantly. They develop their athletic condition and an incredible sense of safety during travel along the trails. We are very keen on their dietary conditions and proper feeding, along with good health care. Darley: What is your favorite spot along the Salkantay Trail? Enrique: The Wayraccmachay (or ‘Wayra’) Lodge, the Llactapata Inca Trail, the Camino Real (the ‘Royal Path’ from Mollepata to Soraypampa), the passage through the Salkantay Pass, etc. All of it!